Mel Stampz: Use your reinkers like Paint: You Can Mix craft, classic, & versamark inks! Use your reinkers like Paint: You Can Mix craft, classic, & versamark inks! You can use reinkers just like paints. Muck about in them: mix, experiment, & create a new look or technique. The acrylic paint-like opacity of craft/pigment inks lets you paint on colours other than white. That's how the Certain Celery craft ink (used to paint the leaves on this card) shows up against the Vintage Violet cardstock. Stamp & emboss your image (this one is done with glue pen embossing) The raised lines of the image make it SO easy to paint. Paint an area with a wash--I love an aqua painter (brush with water in handle) for this. While that area is still wet go in with two colours of 'paint': 1st a light hue then immediately after the 2nd dark colour. Watch them bleed. The more water you have, the more they will bleed, so you can control the look with a little practice. You can go in with darker shades after to add depth. It's always good to keep some little puddles of pure colour (especially white & the darkest shade) to keep dipping your brush into. That keeps your colours from looking muddy. You can mix colour families to get another shade you really love. 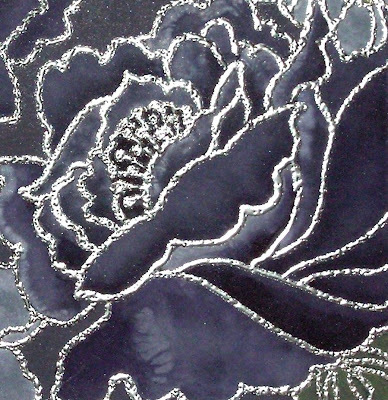 Experiment with shades to get a lot of variety with just white craft ink and a darker shade. If you want to create a custom coloured stamp pad: just buy a cheap empty pad at a craft or stationery store and add two colours of ink to it. Versamark ink, gives a tone on tone 'watermark' effect, You can paint with it (to emboss your painting) mix it with classic/craft inks. This works by extending the drying time and allowing you to sprinkle powder. You can achieve an impasto look (thick paint with visible brush strokes.) You can also tint your own Versamark pads to get a custom translucent ink pad: Just use old (stained) pads & add both colour and Versamark reinker. The white-ish flowers are made a little less opaque & detailed by painting on a wash of white craft ink & then dabbing that with a clean paper towel. SO easy! I will certainly have a go Mel this card is beautiful. WOW! Mel, you are truly an artist! I LOVE how you play around with your supplies and try new things. I'm so inspired by you! Beautiful card! Gorgeous colour! Thanks for the tip on reinker mixing and painting! Mel, I am always amazed with each post. You never cease to outdo yourself. You are a very talented lady. This is so pretty all the painting is gorgeous. Love the colours too! I just love reading your blog! You are a fantastic teacher of technique and stlye. Thank you so much for sharing your wonderful gift. Whoa Mel!! How do I love thee??? Let me count the 80 million ways!!! You are so talented, beyond any stamper/artist I've ever seen. This project is beyond spectacular........I am just *in love* with what you've done with re-inkers. I have officially decided I want to be YOU when I grow up. Love Ya! !